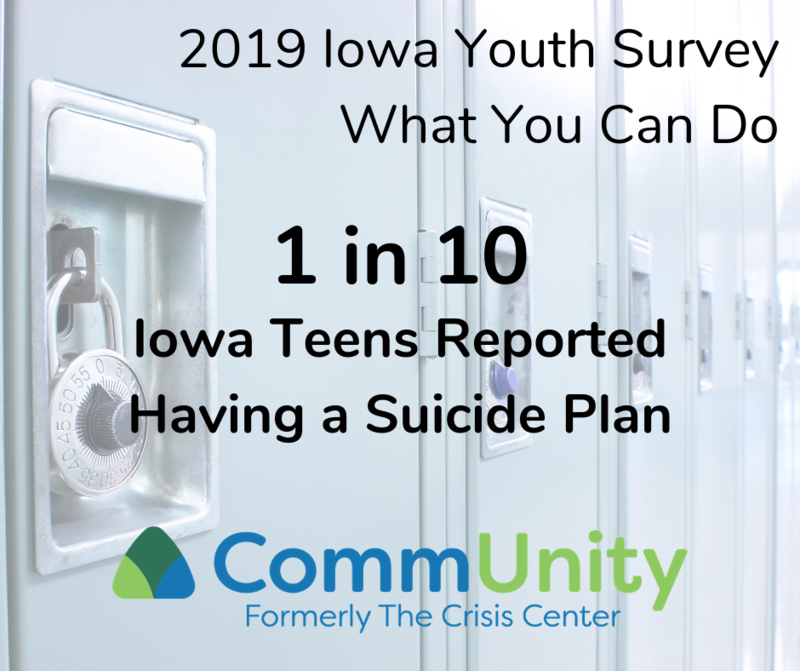 Among 8th and 11th graders in Iowa, more than 1 out of 10 students had a plan for suicide in the last year. 1 in 20 said they had attempted suicide in the last year. This means that a typical classroom of 20 high school students will have 3 who are thinking about suicide, one of which has a specific plan in mind, and one who has already made an attempt. Even as young as 6th grade, 1 out of 15 students had a plan for suicide in the last 12 months. That’s a 71% increase since 2012. Having a plan goes farther than having thoughts of suicide, meaning the risk of a suicide attempt is higher when someone has a plan. In spite of the rising rates of suicide among young people, The National Institute of Health projects that it will spend 3 times as much money to research malaria as that to research suicide. Last year, 13 Americans died of malaria, and 44,281 people died by suicide. What can be done about this, and what can you do to help? At CommUnity, we have had more and more young people reaching out to our crisis intervention program. Last year, we had almost 9000 contacts with people under the age of 19. Roughly 75% of those contacts had to do with suicide. Anyone who is having thoughts of suicide, going through an emotional crisis, or is concerned about someone else can call or text 1-855-425-9246 or chat with us at IowaCrisisChat.org. We are always in search of additional caring volunteers to help provide this service and make sure that we can reach even more young people. You can learn more about volunteering here. CommUnity also provides Suicide Prevention Trainings. Currently these include Applied Suicide Intervention Skills Training (ASIST) and Question, Persuade, and Refer (QPR), as well as custom trainings on topics surrounding trauma. Edit 3/18/19: Number of contacts from people under 19 years of age was updated from “over 2000” to “nearly 9000” for 2018.